In order to begin using the Attendance feature in the Staff Portal, your staff must have a Staff Portal Login ID or a Jackrabbit User ID that has been matched to their Staff record. See Guided Staff Portal Setup. Taking attendance in the Staff Portal is a process that involves marking each enrolled student as either present or absent and optionally adding attendance details or makeup eligibility. 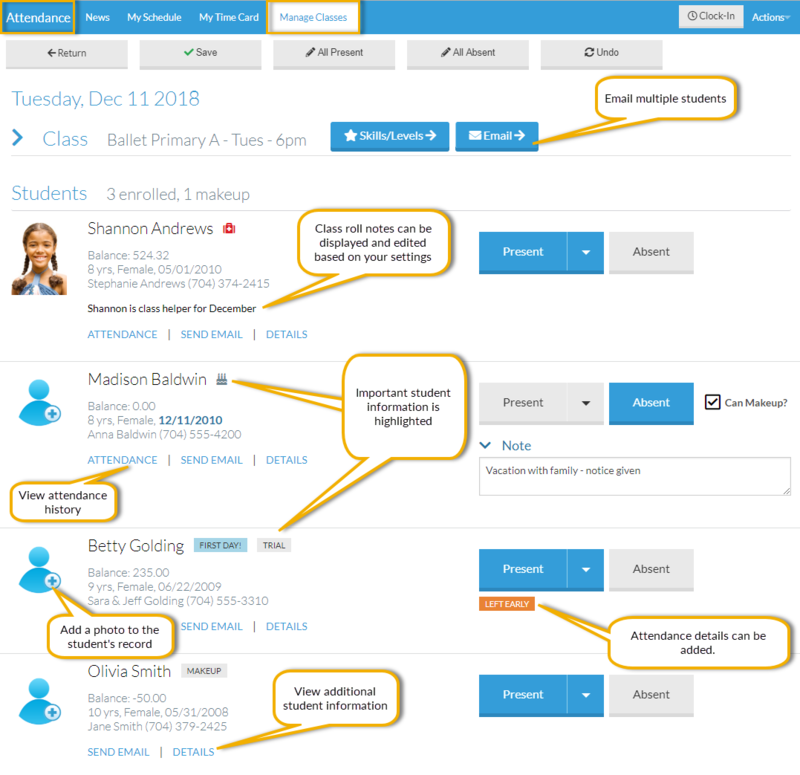 Once logged into the Staff Portal, the Manage Classes tab is where taking attendance starts. Select the Attendance button on the Manage Classes main page to move to the Attendance page. The Attendance page offers your Instructors a wealth of information about the students enrolled in their classes and is where they indicate whether a student is present or absent. Medical information (allergies/special needs/medications) are highlighted with a red Medical Bag icon. Use the Details link to view more information. A student with a birthday in the current month is highlighted with a cake icon and their birth date appears in bold. A student's first day in class is marked with a First Day! badge. A Missed Last Class! badge lets your instructors know immediately that the student needs to be caught up with what they missed. Badges also call out students who are there for a Trial or Makeup class or anyone who is a new Transfer into the class. Optionally, you can display even more information under the student name on the Attendance page. This is customized in the Staff Portal Settings > Family & Student Display Options > Student List Page. See General Staff Portal Settings. The Details link below the student will display additional information about the student. You control which information to display in the Staff Portal Settings > Family & Student Display Options > Show Additional Info. See General Staff Portal Settings. 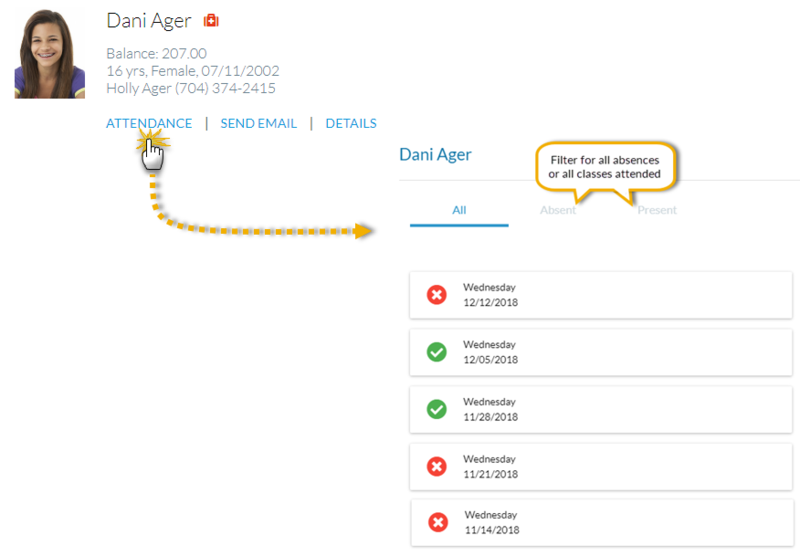 Easily communicate with the families of the students in their classes by sending an email to an individual student using the Send Email link, or to multiple students enrolled in the class with the Email button. Record important information about a student to keep the rest of your Team in the know by entering roll notes (using the Details link) that are saved to the student's record. Stay on top of any patterns with the ability to view a student's attendance history with the Attendance link.